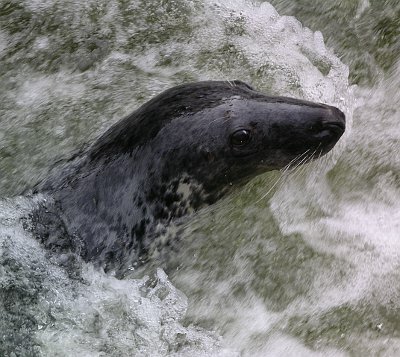 A Grey Seal in Bedford in 2008. Some seemingly implausible records can be true! Data quality is vital to our operation. To ensure that our data are as reliable as possible we only accept records that have been verified by a County Recorder or higher authority. These are the experts on their groups and are able to weed out any dubious records before they reach us. If records come to us independently of the County Recorders we will pass the records to them for verification before we use them. The County Recorders are appointed by the Bedfordshire Natural History Society (BNHS) with which we have a close working relationship. A small number of local experts have also been approved by the BNHS for the supply of reliable records for groups where there isn't a County Recorder. Upon arrival we check each record's location description against its grid reference to pick up the occasional slip, and assign records to the sites in our database. This allows species lists to be easily produced for sites. Records are imported into Recorder 6 where they are matched against its checklists. Where any query exists as to which entry to match we check with the data supplier. Moth records are held in MapMate, updated with syncs from the moth Recorders. Occasionally we are sent records for species in groups for which there isn't a County Recorder. These we keep to one side until they can be properly verified and are not loaded into our database until then. We have nearly 1.6 million species records in our databases. A summary of all the major datasets can be found here.